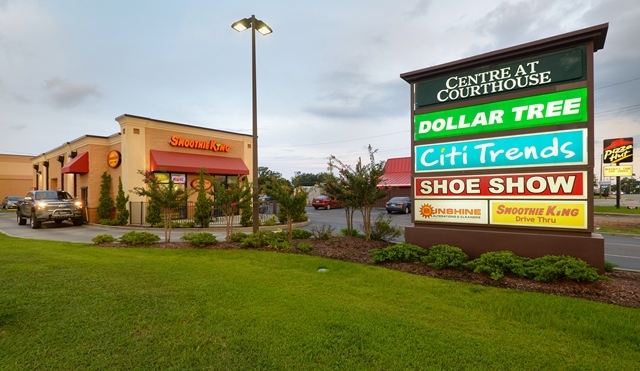 The Centre at Courthouse shopping center is located at 405 East Pass Road, Gulfport, Mississippi. Redeveloped in 2006 from a former National Canal Villere Supermarket, the Property is comprised of multi-tenant main building and a two-tenant out parcel building added in 2011. There is room for an additional 5,000 SF out parcel building along the east side of the site. The Centre at Courthouse Property is situated at the SE corner of Courthouse Road and Pass Road, approximately 5 minutes from US Highway 90 to the south, 10 minutes from US Highway 49 to the west, and 15 minutes from Interstate 10 to the north. Suite 100: Dollar Tree (15,076 SF) – A chain of discount variety stores that sells items for $1 or less. A Fortune 500 company, Dollar Tree is headquartered in the Norfolk suburb of Chesapeake, Virginia and operates 4,900 stores throughout the 48 contiguous U.S. states and Canada. Its stores are supported by a nationwide logistics network of ten distribution centers. The company operates one dollar stores under the names of Dollar Tree and Dollar Bills. The company also operates a multiprice-point variety chain under the name Deal$. Suite 200: Citi Trends (12,405 SF) – Citi Trends comprises more than 513 stores in 29 states. The chain is known for targeting urban, lower-income customers. Citi Trends has been in the apparel business for over 58 years. In May of 2005, Citi Trends became a publicly traded company on the Nasdaq exchange with the symbol CTRN. The headquarters of Citi Trends is located in Pooler, Georgia. There is also a distribution center in Darlington, South Carolina along with one in Roland, Oklahoma. Suite 300: Shoe Show (4,494 SF) – footwear retailer based in Concord, North Carolina. It operates shoe stores throughout the United States under the brands Shoe Show, The Shoe Dept., The Shoe Dept. Encore, Shoebilee!, Burlington Shoes, and Shoe Show Mega. The company was founded in 1960 by Robert B. Tucker and has more than 1150 locations. It acquired Burlington Shoes in 1986, Altier Shoes in 1993 and Shoebilee! in 2002. In the early 2000s, the company began opening Shoe Dept. Encore stores, which are larger than regular Shoe Dept. stores. Suite B: Sunshine Alterations & Cleaners / Courthouse Consignment Shop (1,292 SF) – A privately owned alterations and consignment shop. Dry cleaning services provided off-site. This property was sold October 2017.